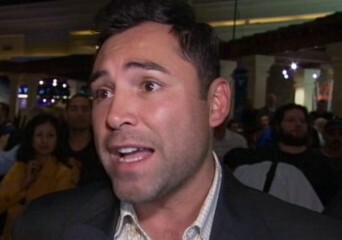 By Chris Williams: Oscar De La Hoya thought Bob Arum’s excuses were comical for him not allowing his fighter Manny Pacquiao to fight Floyd Mayweather Jr. on May 5th. I’m not sure if Arum is aware how bad his excuses are making him and Pacquiao look, but he really needs to quiet down because he’s making look obvious that he doesn’t want to see Pacquiao in a risky fight where the outcome might be bad for him. De La Hoya obviously knows the sport and is aware that it doesn’t take over six months for a cut to heal. On Friday, Arum said he couldn’t put Pacquiao back in the ring by May 5th to fight Mayweather because Pacquiao’s cut from November might not be properly healed by then. On May 5th, it will have been six months since Pacquiao’s fight with Juan Manuel Marquez, which is plenty of time for the cut to heal. Arum also made the excuse that he can’t put Pacquiao in with Mayweather on May 5th because he wants to have a bigger arena in Vegas put together and that can’t happen by May 5th. It just sounded so flimsy the excuses Arum was making. I know he was being interviewed and some of the questions were catching him by surprise but he should have had some gems stored up from his past years of not matching Pacquiao up with Mayweather. Arum should have the excuses well memorized by now, don’t you think?